This Entergy substation SW of Mayflower received a direct hit from yesterday’s tornado. Click the image to open an interactive map for this point as well as other areas along the damage path. It’s April again and that unfortunately means it’s tornado season. Clicking the image to your right will take you to an interactive story map showing the tornado path for this storm, with links to videos, pictures and other supporting information. The story shows a step by step view over a 60 minute period during the life of this tornado. This storm rotation path is based on NWS Weather Radar observations. Points were added to depict the center of rotation at roughly five minute intervals as the radar updated. Those points are then connected to depict an approximate rotation path, which is then buffered on each side to depict a 1/4 mile, 1/2 mile and 1 mile wide area. The tornado width has not yet been determined by NWS Little Rock, however these ranges help to depict likely impact areas, with the most likely impact area being the 1/4 mile wide corridor (red area), followed by the orange area (1/2 mile wide corridor) and finally the 1 mile wide corridor (yellow area). Additionally, the damage photos and videos were added to the story map AFTER the damage path was created. This means that as videos and pictures are reported to/by local media, social media, emergency managers, etc., the location of the photos can be compared against the preliminary estimated damage path in order to verify the accuracy of the information. The preliminary impact corridor is essentially serving to identify the hazard zone. On top of that map, information on community facilities, demographics, etc can be overlaid, thus creating an realtime operational impact analysis or risk assessment. That in turn can be used to help refine the response to the hazard so the community can respond and then recover as fast as possible. When you don’t know the impact zone of any natural disaster, it’s nearly impossible to get your arms around the situation and make sure that the appropriate resources are being called upon to assist in the response. However when the impact zone is clearly identified, it can facilitate improved collaboration and effectiveness of the response – from individual citizens and neighbors, to community groups, charities and finally local, state and national officials. If you find this resource helpful, please pass it on to others. Thanks. Interactive ESRI Story Maps view of the April 27, 2014 tornado that impacted Mayflower and Vilonia, AR. UPDATE: 536pm CT – The National Weather Service office in Mobile, AL has released the preliminary storm survey results confirming two tornado tracks in their forecast area produced by the same storm that impacted Hattiesburg, MS. The storm survey team found EF-1 intensity damage in Wayne County with a tornado tracking nearly 17 miles in a discontinuous path. The tornado first touched down near the community of Clara and then tracked to Denham before lifting. Additionally, EF-0 damage was found in Northwest Perry County – an extension of the track of the same tornado that moved through Hattiesburg and Petal, MS.
Additional details will be forthcoming over the next few days after survey teams complete their data, especially looking on Tuesday in the Washington and Clarke County areas in Southwest Alabama. UPDATE: 505pm CT – The National Weather Service in Jackson, MS has just upgraded the intensity from the Hattiesburg / Oak Grove tornado that impacted Lamar and Forrest Counties yesterday. The tornado was preliminarily rated EF-3, but that rating has since been upgraded as damage consistent with 170mph winds was observed in the area of Oak Grove High School. This violent tornado was only the second violent tornado (EF-4 or EF-5) recorded in Lamar or Forrest Counties since record keeping beginning, the other tornado being the April 24, 1908 Purvis tornado which was on the ground for 155 miles and impacted a wide ares from Louisiana into Mississippi (Source: NWS Jackson MS). The NWS storm survey teams have also preliminarily confirmed EF-2 tornado damage in Southwest Marion County – a separate track from the tornado that hit Hattiesburg. This confirms the suspicions in the original post that the storm “cycled” and produced separate tornadoes – as indicated by radar signatures. Storm survey teams preliminarily confirm EF-2 tornado damage in SW Marion County. Seperate tornado track from the one that hit Hattiesburg. “We were blessed”. That is what the Mayor of Hattiesburg, Mississippi said repeatedly when interviews on CNN after a strong tornado tore through the city on an otherwise calm Sunday afternoon in February. As he stated repeatedly, even though the University of Southern Mississippi, several high schools, and the American Red Cross center were all directly hit by this storm, there were only limited injuries and not fatalities. The fact that we’re reporting on damage to buildings, NOT fatalities is key in this story, and with storms like these, timing is everything. According the University website, several structures in the southern portion of the campus were damaged including Jazz Station, the Mannoni Performing Arts Center, Ogletree Alumni House, and Elam Arms. Mississippi is no stranger to strong tornadoes as we have seen in years past in places like Yazoo City. 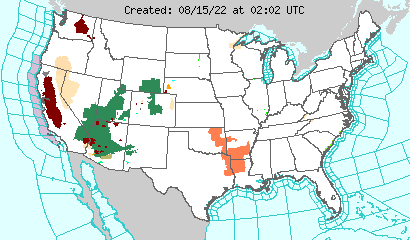 This storm was similar to previous supercells producing long-lived tornadoes. 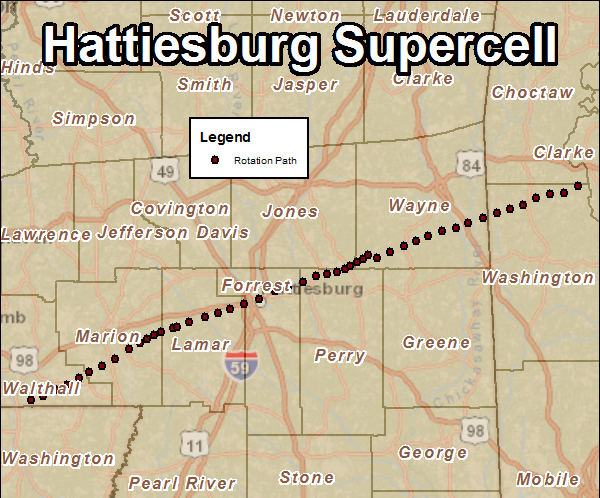 The supercell tracked from Southern Walthall County in Southern Mississippi through the counties of Marion, Lamar, Forrest, Perry, Jones and Wayne. The same storm was also responsible for damage near Millry and Coffeeville in Washington and Clarke Counties in Southwest Alabama. Radar-based rotation path for the Hattiesburg, MS supercell. Note the path changes and possible locations for breaks in the path (cycling supercell). In all, it is pretty likely that there were multiple tornadoes along this path. The worst of the damage appears to be EF-2 to EF-3 in intensity, with the Hattiesburg tornado causing damage consistent with a tornado of at least EF-3 strength. EF2 and greater tornadoes are rated as strong, so regardless of the damage, it is clear to say that the area was impacted by a strong tornado. Tornadoes are rated by the damage they produce. On a related topic the National Weather Service in Mobile tweeted the following graphic. Incredibly their 30 minute forecast for this supercell was HIGHLY accurate both temporally and spatially. The storm passed within a mile of Robinson’s Junction at 0027 UTC – right in line w/ the forecast graphic below. The use of Social Media in this case to not only get out the tornado warnings, but to EMPHASIZE areas that are at greater risk represents a MAJOR opportunity for the National Weather Service to enhance their communication with customers. NWS Mobile – Projected Path of Tornadic Supercell – VERY ACCURATE 30 MIN FORECAST – Storm passed w/in a mile of Robinson’s Junction at 0027 UTC. New Tech City: Using Digital Maps To Study Disaster Preparedness and History – WNYC. 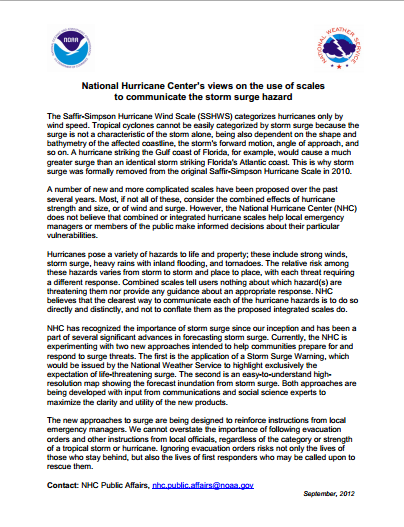 Hurricane Storm Surge Scales – What Does the National Hurricane Center Think? 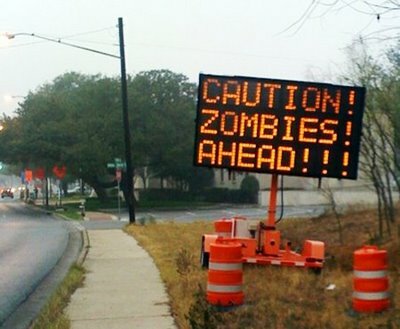 Many of my followers on Twitter (Follow @emgis on Twitter) and this blog know of the CDC’s preparedness campaign from earlier this year on Zombie Preparedness – “Preparedness 101: Zombie Apocalypse“. However most people who are familiar with the preparedness campaign are from the Social Media for Emergency Management (#SMEM hashtag on Twitter) community. Most of them are not GIS people and haven’t seen how Geographic Information Systems (#GIS hashtag on Twitter) can improve our preparedness for Zombies (and for other disasters…) Additionally, the Connected Principals Chat community (#cpchat hashtag on Twitter) could benefit from this post because it provides another way to engage students and parents on a number of levels. You may not use zombies for important information to share, but please take a look at these examples and think of how you can apply this to your discipline and the content that you find important to share with others. When it comes to earthquakes and being aware / ready for major earthquakes, you might think of the San Andreas Fault, or places like Japan, Chile, China, Mexico or Indonesia. However in the past year, there have been two extremely significant earthquakes in the United States that were “outliers” from previous events. Both of these were felt over large areas and measured above 5.5 on the Richter Scale.